Does Ceiling Fan Keep Room Cool When The Weather Is Hot? A ceiling fan is an important equipment to have in your home especially during the hot season. This type of fan has the ability to circulate air in the room and create a wind chilling effect that will ensure everyone in the house is comfortable. Ceiling fans are still the most effective fans in the market today, because they can effectively create a draft by circulating the air inside the room. In case you also use air conditioning system in your home, a ceiling fan can allow you to set the thermostat to about 4 degrees Fahrenheit without compromising the comfort. During the hot weather season, a ceiling fan will allow you to stop using your aircon altogether. You can install a ceiling fan in each room of your home that requires cooling during the hot weather. 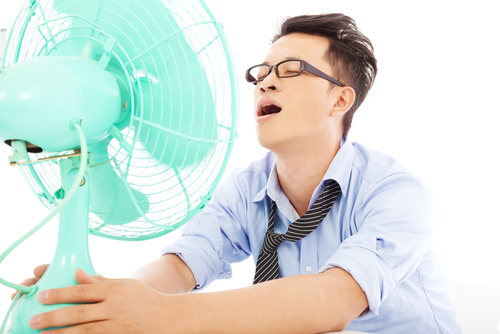 Make sure to turn off your fan before leaving your room, because fans are used for cooling people and not rooms. Ceiling fans are applicable in rooms that have ceilings height of at least 8 feet high. These fans work effectively when their blades are between 7 and 10 feet above the floor. Ceiling fans are supposed to be installed in such a manner that their blades are not closer than 8 inches away from the ceiling and at least 18.5 inches away from the way. Larger ceiling fan blades provide comparable cooling compared with smaller blade at a lower speed. This is important especially in offices or work environment where papers or other lighter objects can be disturbed by the strong breeze. Fans can be fitted according to the aesthetics of a room, meaning that large fan can appear to be overpowering when installed in a small room. There are more expensive fans that operate quietly and smoothly, and are likely to give you longer service than the cheaper units. Installing a ceiling fan at home or workplace can provides convenience. These units are very important since they provide wind chill effect that eventually reduces the discomforting heat in your home. Who would really want to spend time in his/her house with the heat? Apart from creating a cool circulating air in the house, ceiling fans are also beautiful accessories to have in our homes due to their design. These units come in different designs and sizes that are suitable for you to choose from depending in your home interior design. Once you pick the right one, you can be sure that have added something beautiful to your home. Ceiling fans can easily be installed without the help of experts. Although in some cases you need to use a professional aircon expert, ceiling fans can be setting up without much help. The fans can be assembled and installed at the right place by just follow the simple installation process provided. Ceiling fan will provide you with much more than cool breezes during the hot weather. The fan can help to reduce your energy utility bill, because you don’t have to use your air conditioner. Ceiling fans consume about 30 watts compared to air conditioning system, which consumes 3 kilowatts. Today’s ceiling fans come in various sizes, which means you can install a fan in any room no matter its size. You can find any model that suits your needs. Ceiling fans do not lower the temperature of a room, but instead they ventilate or circulate air, which helps to speed up the perspiration process of your skin. Ventilation process makes your room comfortable replacing the hot stuffy air with fresh air. The following tips will help you make the right decision when selecting a ceiling fan. Most people oftenly think of aesthetics when select a ceiling fan. Selection should narrow down to the size and design of the blades that can fit well with your home decor. Blade architecture helps to determine how effective the blade will move the air and to be more specific the blades pitch. The optimum pitch of the blade should be 14 degrees, which is the right position for maximizing the efficiency of moving the air. Other important factors to consider include the blade construction and balance. Ceiling fans are not only meant to move air in the room. Style plays a key role when selecting the right fan for your home. With many styles available in the market for you, finding the right style that will compliment the decor in your home is much easier. This is an extremely important factor! Fan motor is the engine of the equipment and therefore you don’t want a ceiling fan with a weak motor that, hums, buzzes or clinks during operation. Cheap fans have weal coverings that keep vibrating and rattling when it’s working. Expensive fans are well designed and more solid. The lighting fixture should provide the right level of light that serve your needs. Lighting requirements will vary from one room to the other. For instance, you need a bright lighting in kitchen compared to bedroom. A good option is to fit a dimmer switch that allows you to adjust your lighting to the desired brightness. Ceiling fans come in different sizes and the room size will determine the size of the fan you need to buy. Installing a very big fan in a small room will look awkward, while the small one in a larger room will make the fan inefficient when circulating the air. For ceiling that are 9 feet high or less, look for close mount fan. Ceiling that are higher than 9 feet, you can select either a standard/angled mount that has an extension rod. Most of the efficient fan blade should be 8-9 feet above the floor. This will ensure you get the best cooling effect. Why consider a reversible fan? These are multi-functional units that will cool your room during the hot weather and also keep you warm in cold season. This type of fan will save energy during the hot season and cold seasons too. You will use less energy from your heater if you have reversible fan.